This image depicts the relationship between the geologic map and topography in the Promontory Butte area of the Mogollon Rim, north of Payson, Arizona. 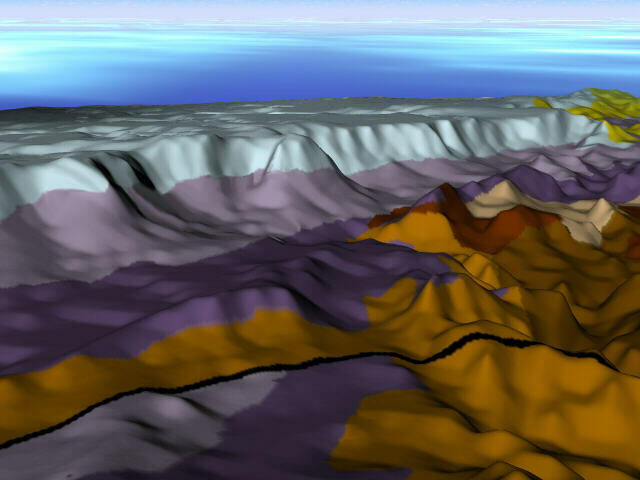 It is a view toward the northeast, and was produced by draping a simplified version of the geologic map over simulated topography derived from the USGS digital elevation data. The 3D perspective was done using metatools Bryce. The main cliff is the Mogollon Rim, an erosional escarpment capped by Permian limestone and sandstone (light blue color on the geologic map). These same rocks continue onto the Colorado Plateau in the distance. Below the Permian cliff-formers are softer, more easily eroded Pennsylvanian-Permian redbeds and limestone of the Supai Group and Naco Group (light purple). Below these are Mississippian through Cambrian limestone, dolomite and sandstone (dark purple). Underlying all these rocks are much older Precambrian granite, quartzite, and metamorphic rocks, shown with various shades of tan, brown, and reddish brown. The thick dark line is the Diamond Butte fault, which downdrops the Paleozoic units on the south side of the fault. The fault is no longer active, but the Mogollon Rim is being eroded slowly back to the northeast.